As the capital of a great country, almost all available in Moscow. Including food affairs. All international restaurants from all corners of the world known as Kentucky Fried Chicken, Rostick, Starbucks, McDonald’s, Dunkin Donut’s, and Pizza Hut available. 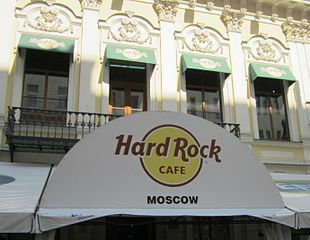 There is also a traditional restaurant that sells Russian food such as Mu Mu, Grabli, Yolki Palki, and Kartoshka.In addition, many traditional Asian restaurant like Tanuki, Kebab, Viet Cafe, and Mama Tao.The small cafe is famous also available in Moscow as Le Pain Quotiditien, Nisa Chocolate, Café House, and Kaiser. Many restaurants in Moscow that offer package business lunch menu with prices fairly cheap at around 300 rubles. Predefined menu with several variations and quite complete as a soup or salad as an appetizer, a main meal and a drink. Business lunch is often offered in Chocolate Nisa, Pizza Hut, Viet Café, and several other Japanese restaurants. Such offers may change at any time so that the tourists need to ask first. Business Lunch menu only applies on weekdays from 12:00 until 16:00. The price of food in the cafe is very varied, depending on the location and quality of food offered. Moscow re Storan many small cafe that sells name.So you need to be vigilant. If the bread is offered a typical Russian bread, then the price could be cheaper when compared with foods that come from Europe. Nearly travelers very rarely deceived by food prices in Russia, all prices can be seen in the menu provided. If you want to enjoy a cafe with good quality and reasonable price, try to go to Kaiser. Flavored drinks and bread is almost the same as most cafes in Paris. If you want a taste of Russian cuisine at a low price, it is advisable to get into the restaurant Grabli. Travelers in this restaurant are offered a buffet dishes typical of Russia.There is a fruit juice drink called Kompot, Brosk Soups, Salad Julien, and Fish Soups Ukha. All meals can be selected according to the budget so that expenditures can be well controlled. Restaurant with low prices can also be found on campus. The restaurant is open to the public are usually still receive government subsidies, food prices are relatively cheap. When travelers pass through the university complex and the restaurant is open to the public, please do not hesitate to get in because the price of food does not drain your money. If you want to buy cheap food. The best choice is a Russian bread sold in various places. Such bread can be found in the shop driveway metro station, on the side of the road until at large stores. The bread is enough to make a full stomach. By paying 30 rubles, you get a menu of the most practical long traveled the circumference of Moscow. Yeah, Our Contributor say that if you want to feel like russian, you should be visit Grabli. I like this place, because it perfect contact with the soul of any foreigner. Over two visits, we tried taste the pirozhki, borsch (with goose meat) & dumplings. Russian dumplings filled, it typically meat, served with sour cream. The location of the restaurant is very good, a short walk from the underground. Besides quick and tasty, nutritious and very inexpensive and the price is good. It is a good place to have a lunch or dinner. With friends happened to dine here. Food is delicious! I would especially recommend steak. In General wanted to try a lot of things, especially some of the waiters knew English and could safely be asked to talk about the dishes) You can always find a free table and not to worry that will be. I would def go again. The first thing that was a pleasant surprise – a low price, I would note that we have come here to tea and a bite to eat something Russian. Good hearty Russian food, excellent friendly service. Want to quickly tasty and quality food You here!